Patients who wear dentures usually require adhesives or pastes to help the denture from becoming dislodged or falling out of their mouths. 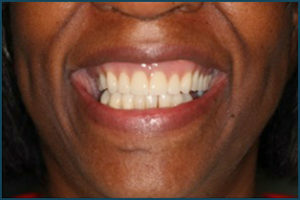 Dental implants can be used to provide excellent support and retention of the denture so dislodgment of the denture does not happen. 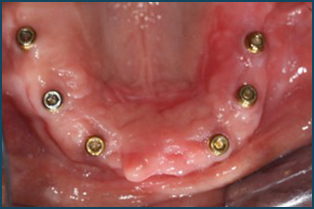 The implant supported denture will allow the patient to be able to eat any type of food without fear of the denture moving or falling out of their mouth. 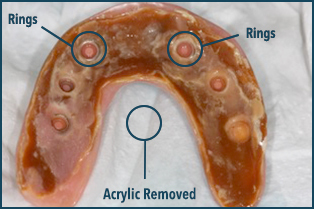 Also, the upper denture can be made much smaller by removing the acrylic over the palate. This will allow the patient to be able to talk better and taste their food and beverage as if they had natural teeth. 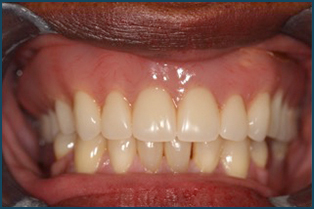 The images below will give you a better understanding of what undergoes with an implant overdenture.